I really appreciated two related articles in the October issue of The Psychologist: Neil Martin’s ‘A persistent misconception’ highlighting the popular learning styles fallacy and focusing on why certain approaches to learning work better with some learners than others; and Madeleine Pownall’s lament on the failure of A-level psychology to prepare students for the verydifferent experience of undergraduate study. 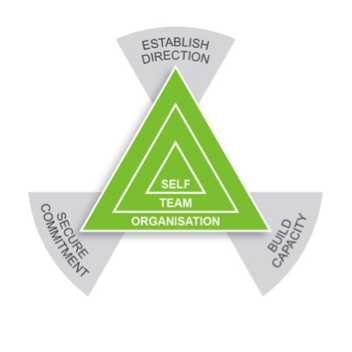 I’m an organisational psychologist focused on developing leadership and team performance, not an educational psychologist or academic, but it occurred to me that the same Three Core Disciplines (Boston, 2014; explored more fully in Boston, 2018) that help my clients thrive in their environments also apply to the business of learning. To learn effectively, we need clarity on what it is we need to learn. In many cases, that ‘direction’ (the first Core Discipline in the image) will come from the outside. For example, from the curriculum as specified by faculty (the ‘team’ around us), the organisation that employs them and the government and professional bodies that shape the direction of that curriculum. Lack of alignment between any of those entities will generate tension in the system that will likely impede our learning and our ability to pass the necessary exams. In addition, if the curriculum as defined by those entities isn’t aligned to the direction in which the wider operating environment is heading, then the learning will prove unfit for purpose and we’ll find the resulting knowledge and skills fail to prepare us for the next stage in our lives – the very problem Madeleine Pownall is seeing in the lack of alignment between A-level direction and degree direction. As many of us have seen or experienced ourselves, lack of alignment between what’s on offer and the learner’s desired direction undermines our commitment to learning. I, for instance, will probably never learn to ski because it’s not a sport that’s aligned to the direction I’m looking to head in my life, which includes among many things a desire to holiday in warm places. Motivation to learn is frequently flagged as a critical success factor in learning. If we want to learn, whether we’re motivated by praise, fear, a sense of accountability or an intrinsic love of the subject matter, we’re more likely to learn. I think it’s partly this that lies behind the widespread belief in learning styles. Learning design that factors in a variety of styles should in theory make for a more varied learning experience, which should in theory keep people interested. Similarly, one would expect that a learner who believes they’re being told the training/teaching matches their learning preferences would be more prepared to engage with it. So it’s hard to believe there’s no benefit even at the placebo level. Sticking with the notion of commitment and turning back to the concentric triangles at the heart of the model, it’s not just the learner’s commitment that’ll affect learning outcomes. Without the commitment of faculty, institution and the external environment we’ll struggle to learn as effectively. Remember those classic ‘Pygmalion’ studies showing that teachers’ belief in their students’ potential has an independent effect on those students’ success (Rosenthal & Jacobson, 1968)? That’s the power of a teacher’s commitment on learning outcomes. And, as with the learner, the educator’s commitment will depend to varying degrees on intrinsic and extrinsic rewards, so we need to ask ourselves whether our reward and performance-management mechanisms are truly feeding that commitment. Commitment and the lack of it are often contagious, so our commitment as learners is heavily influenced by the commitment of others. The enthusiasm a teacher or lecturer shows for the topic; the attitudes of our fellow learners (another ‘team’ around us in this context); the positive or negative messages we receive explicitly or more subtly from our friends, family, the media and other role models regarding the subject we’re studying; those people’s attitudes to learning and education. All of these factors influence our commitment. And finally, there’s capacity. Learning sits at the very heart of capacity-building, but learning efficacy depends on a range of capacities in its own right. It’s harder to learn when the organisation, faculty or teacher lacks the necessary skills, knowledge and resources. I recall being outraged when a friend who’s a teacher was required to teach French and Maths despite not speaking French and having failed O-level Maths multiple times as a teenager. That the school felt they had nowhere else to turn was a measure of a systemic failure to help that school build its own capacity. In a completely different league, the focus of each university’s psychology curriculum is determined by its existing capacity, as few institutions can claim parity of representations across the numerous Sections and Divisions of the BPS. Neil Martin speaks to individual capacity when he cites Kirschner and van Merriënboer (2013) and Kalyuga et al. (2003), arguing that tailoring instruction to learners’ existing levels of knowledge or cognitive ability is far more effective than indulging the learning styles fallacy. From my perspective, this acknowledges that the individual’s base capacity to learn will be a factor in successful learning. It also reminds me of reading my old school reports (from a high capacity fee-paying school), in which the teachers wrote that I needed to learn how to revise – effectively to learn how to learn. These reports, of course, were written for my mother, a single parent who had left school at 16 and was working incredibly hard to feed, clothe and house her two children. Surely it should have been those teachers, those specialists in education – not her – who took responsibility for building that capacity in me…? A key ingredient to capacity – alongside skills, knowledge and resources – is the processes the learner and the learning system use in service of the learning. I believe learning styles were an attempt to create some good process. What Kirschner and van Merriënboer suggest is a process. Kolb's learning cycle (Kolb & Fry, 1974) is a process. Individual learners have their own processes when it comes to learning, developed through a mixture of observation, experimentation and instruction. Their educators have their own processes, developed in much the same way. 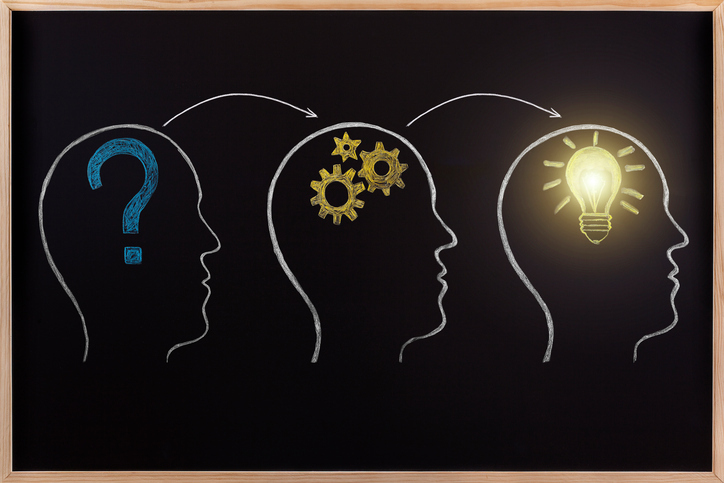 What psychology offers education in general is an evidence-based approach to choosing the right process(es) to achieve optimal learning outcomes for the learner and the wider system. That in itself should increase all stakeholders’ trust in the business of learning as practised by educational institutions, which is a key ingredient in securing their commitment, so essential to the success of any learning intervention. But let us not forget that we psychologists are also students of motivation, giving us a privileged position when it comes to working out what each learner and each stakeholder needs if they’re to fully commit to the process. As I said at the outset, I’m an organisational psychologist specialising in leadership and team performance, not an educator in the academic world. It’s some time since I completed my own A-level, undergraduate degree and postgraduate qualifications – the second of which was an alarming demonstration of worst practice in education. However, the persistent misconception that learning styles are valid and Madeleine Pownall’s current first-hand experience of transitioning from A-level to degree suggest the same patterns and problems are still in play. As a relative outsider operating in a discipline that has its own glass walls, I’m conscious of my own knowledge gaps and misconceptions, so I’m here to offer a tool in the spirit of friendship, not to throw stones. With that in mind, it seems to me that when it comes to teaching our own discipline, we should be applying everything we know about commitment and capacity and also taking a key role in setting direction, ensuring that what is taught, how it is taught and when it is taught maximises psychology’s chances of meeting society’s diverse and evolving needs. We can only do that if we’re able to be role models for aligning the needs and agendas of a multitude of stakeholders in a very complex system. That’s a tough ask and we’re a far-from-united profession, but I’d like to think that the qualities that drew us to this profession are the same qualities that will enable us to rise to the challenge. Boston, R. (2014). ARC Leadership: From surviving to thriving in a complex world. London: LeaderSpace. Boston, R. (2018). The boss factor: 10 lessons in managing up for mutual gain. London: LeaderSpace. Kalyuga, S., Ayres, P., Chandler, P. & Sweller, J. (2003). The expertise reversal effect. Educational Psychologist, 38, 23–31. Kirschner, P.A. & van Merriënboer, J.J.G. (2013). Do learners really know best? Urban legends in education. Educational Psychologist, 48, 169–183. Kolb, D.A. & Fry, R.E. (1974). Toward an applied theory of experiential learning. MIT Alfred P. Sloan School of Management.